One of the most iconic names in sports car history is Toyota’s Supra and since it went out of production in 2002, there’s been a definite void left behind. 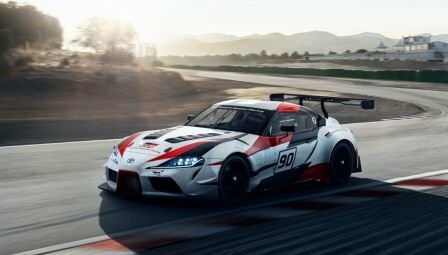 Fans of the Supra got a big surprise on March 6th when, during the 2018 Geneva Motor Show, Toyota revealed a new concept for the car’s rebirth: The GR Supra Racing Concept. Looking sleeker and sharper than ever, this glimpse into the future of the Supra has a lot of people excited, including the staff here at Westbury Toyota. While the exact details of the Supra’s impending rebirth into the automotive world aren’t all known just quite yet, we do still have plenty of information about it that we’re happy to share with you. The new Supra has been in the works since 2012. As Peter Lyon of Forbes magazine reports, that’s the year that the new Supra’s chief engineer, Tetsuya Tada, got together with BMW in order to discern whether using a partnership to create a sports coupe was feasible. Tada has some pretty impressive credentials: He was behind the development of Toyota’s other supercar offering, the 86, and his former mentor, Isao Tsuzuki, led the development of the previous Supra. For the past six years, Tada and other creative minds have been hard at work bringing a concept of this incomparable coupe back into existence – and now we finally have a glimpse of what awaits us in 2019. As Viknesh Vijayenthiran of Motor Authority explains, it was decided that the newest Supra needed to have a straight-six engine, which is where the partnership with BMW comes into play. The German automaker had the exact kind of engine required, which means that we can expect a turbocharged 3.0 liter (L) straight-six engine capable of (at least) 335 horsepower (hp) on one or more of the Supra models. Going a step further, it appears that Supra fanatics can also expect to see the engine paired with an eight-speed automatic gearbox. Lower Center of Gravity – This is impressive when you consider that the 86 already has an impressively low center of gravity due to its flat engine. Incorporating a straight-six engine into the Supra’s design while maintaining a low center of gravity was a big challenge, but Toyota has addressed this issue through a number of innovative factors such as a mounted steering rack. Shorter Wheelbase – In a bid to scale down proportions, the upcoming Supra has a shorter wheelbase than the 86, making it a two-seater only. Even Weight Balance – The Supra will have perfect 50/50 weight distribution. More Rigidity – The Supra’s body is nearly twice as rigid as that of the 86. As you can see, innovation and enhanced performance were obviously primary factors in the process of differentiating the new take on the Supra from Toyota's already existing supercar. Unfortunately, as of right now all we can do is eagerly await more news about the Supra. Scheduled for production in 2019, we here at Westbury Toyota know beyond a doubt that the return of this iconic coupe is going to excite people like nothing else can. Toyota’s chosen to revive a legend, and what’s more, improve upon that legend. We can’t wait until the anticipation is over and we can see the real deal in person – and share it with you!